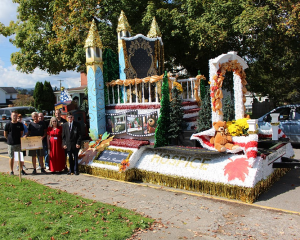 Mountain Hospice gains top honors with their float during the Mountain State Forest Festival. This year’s theme, “The Majestic Roads Lead to Royalty”, showcased husband and wife team Marvin and Sharon Brown. This husband and wife team, both volunteers at Mountain Hospice, adorned the top of the float as our royalty portrayal. The body of the float was designed with roads weaving throughout, with the Elkins, West Virginia Mountain State Forest Festival Train and United States Flag anchoring the rear of the float. divisions, receiving the “Grand Silvia Award”. Mountain Hospice, “Comfort and Compassion When It’s Needed Most”. 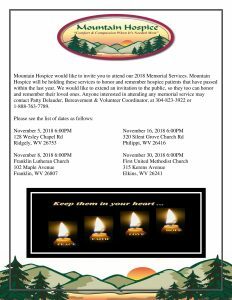 Mountain Hospice will be holding their annual Memorial Services throughout November to honor and remember hospice patients that have passed away within the past year. We would like to extend an invitation to the public so they too can honor and remember their loved ones. Anyone who is interested in attending may contact Patty Delauder, Bereavement & Volunteer Coordinator, at (304) 823-3922. You may email memorialservices@mountainhospice.com for additional information as well! 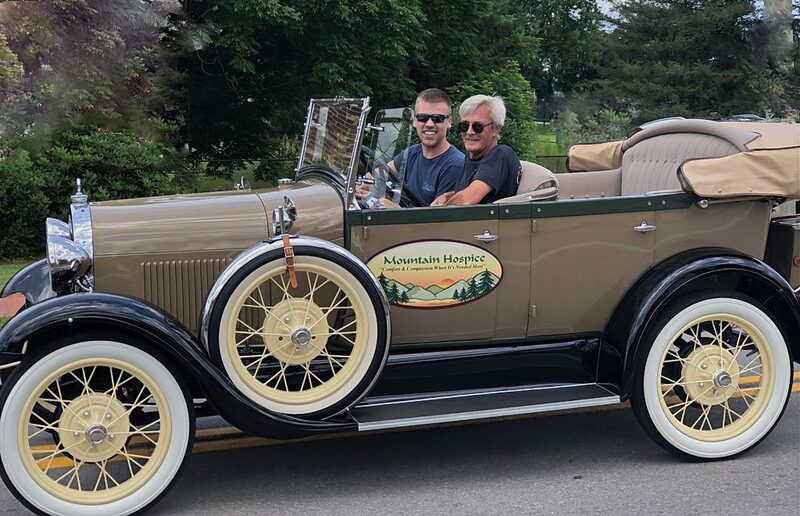 Mike Elza, Director of Marketing and Public Education, and Austin Currence, Marketing Assistant, took part in the annual Beverly Fireman’s Festival Parade this past weekend. REMEMBER: Not all hospices are the same. Contact Mountain Hospice, your only hometown hospice in West Virginia. An organization with zero deficiencies obtained during a recent Medicare OFLAC Survey. Mountain Hospice provides “Comfort & Compassion When It’s Needed Most”. Belington WV May 22, 2018 — Mountain Hospice has been named a 2018 Hospice Honors recipient by HEALTHCAREfirst, the leading provider of Web-based home health and hospice software, billing and coding services, CAHPS surveys and advanced analytics. Hospice Honors is a prestigious program that recognizes hospices providing the highest level of quality as measured from the caregiver’s point of view. Award criteria were based on Hospice CAHPS survey results for an evaluation period of October 2016 through September 2017. Award recipients were identified by evaluating performance on a set of 24 quality indicator measures. Performance scores were aggregated from all completed surveys and were compared on a question- by-question basis to a National Performance Score calculated from all partnering hospices contained in the HEALTHCAREfirst’s Hospice CAHPS database. Hospice Honors recipients include those hospices scoring above the HEALTHCAREfirst National Performance Score on 20 of the evaluated questions. HEALTHCAREfirst holds a special recognition, Hospice Honors Elite, to honor hospices scoring above the HEALTHCAREfirst National Performance Score on all 24 of the evaluated questions. Please visit HEALTHCAREfirst’s website at www.healthcarefirst.com to learn more about HEALTHCAREfirst Hospice CAHPS survey program as well as the Hospice Honors awards. 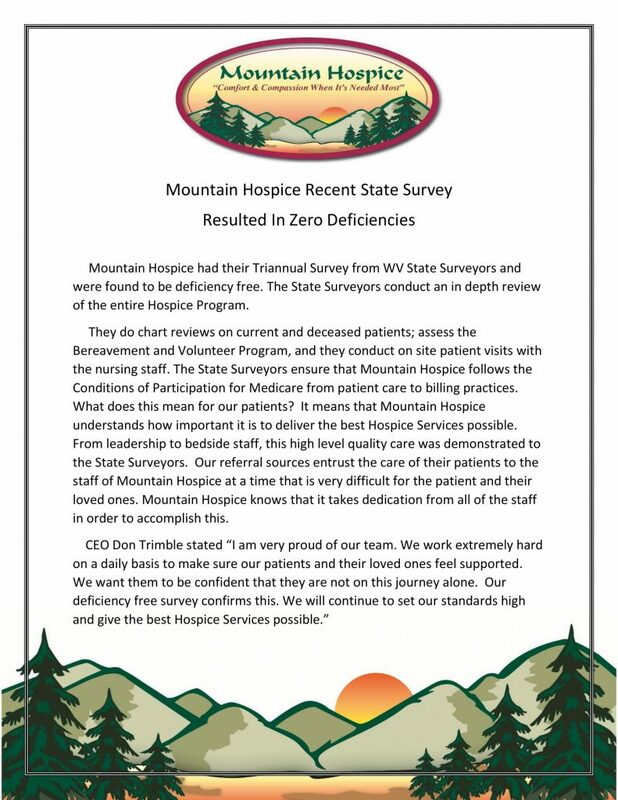 Mountain Hospice had their Triannual Survey from WV State Surveyors and were found to be deficiency free. The State Surveyors conduct an in depth review of the entire Hospice Program. They do chart reviews on current and deceased patients; assess the Bereavement and Volunteer Program, and they conduct on site patient visits with the nursing staff. 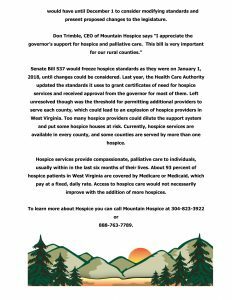 The State Surveyors ensure that Mountain Hospice follows the Conditions of Participation for Medicare from patient care to billing practices. What does this mean for our patients? It means that Mountain Hospice understands how important it is to deliver the best Hospice Services possible. From leadership to bedside staff, this high level quality care was demonstrated to the State Surveyors. Our referral sources entrust the care of their patients to the staff of Mountain Hospice at a time that is very difficult for the patient and their loved ones. Mountain Hospice knows that it takes dedication from all of the staff in order to accomplish this. 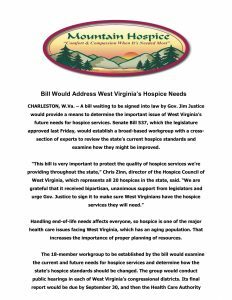 BELINGTON — Social workers at Mountain Hospice help provide support and education to patients and families who are facing a terminal illness. In addition, they help with advance directives and making patients’ wishes at end-of-life known. The social workers at Mountain Hospice often go above and beyond their duties as social workers, spending a little extra time with a patient or family member who needs extra care. Or you may hear of a social worker who helped a husband and wife renew their wedding vows after 63 years of marriage or take one last vacation together to the beach. You may hear of a social worker who helped get a ramp built for a patient so she could get outside and enjoy her garden and grandchildren. A social worker may help a veteran get the services they deserved through their local Veterans Affairs Clinic. The social workers at Mountain Hospice are touching the lives of the patients and families each day in their own special way. Mountain Hospice social workers stand up for patients and families.